Welcome to Episode 14 of the “‘What Would Sharon Raydor Do?’ podcast, the podcast devoted to getting an in-depth view at Major Crimes Commander Sharon Raydor by the woman who knows her best, Mary McDonnell. Mary discusses the events of Conspiracy Theory, Part 4, and her feelings about the episode, the choices made, and addresses the reaction to the episode and the events. Welcome to Episode 13 of the “‘What Would Sharon Raydor Do?’ podcast, the podcast devoted to getting an in-depth view at Major Crimes Commander Sharon Raydor by the woman who knows her best, Mary McDonnell. Wedding time! We discuss the long-awaited wedding of Sharon and Andy, and Olivia talks about her guest role as the wedding singer, and her experiences working on the show. Mary discusses the recent developments with Sharon Raydor and her health, faith, and what lies ahead as the season progresses. Welcome to Episode 11 of the “‘What Would Sharon Raydor Do?’ podcast, the podcast devoted to getting an in-depth view at Major Crimes Captain Sharon Raydor by the woman who knows her best, Mary McDonnell. Recorded with Mary McDonnell. Guest hosted this week by the editor of MajorCrimesTV.net, Mina Sharpe. In this episode Mary and Mina discuss the season 5 finale of Major Crimes, Mary (and Sharon’s) take on the events of the finale, and some insight into the season as a whole, and what’s ahead for season 6. FEEDBACK/QUESTIONS: Ask your questions by tweeting with the hashtag #WWSRD! Commenting under each podcast on Facebook, or on MajorCrimesTV.net. Have a Major Crimes or Mary McDonnell fan in your life? Please share this podcast with them! If you love the podcast, subscribe and never miss an update! Thanks for listening, and we’ll see you next season! Welcome to Episode 10 of the “‘What Would Sharon Raydor Do?’ podcast, the podcast devoted to getting an in-depth view at Major Crimes Captain Sharon Raydor by the woman who knows her best, Mary McDonnell. In this episode Mary and Mina do some season 5 catch up and discuss the engagement and Sharon’s thoughts on recent developments in both her life and with the squad. Mary remembers Battlestar Galactica co-star Richard Hatch, and makes a special announcement about an upcoming event. 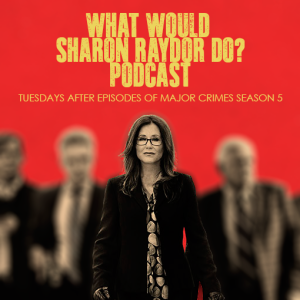 Welcome to Episode 9 of ‘What Would Sharon Raydor Do?’, the podcast devoted to getting an in-depth view at Major Crimes Captain Sharon Raydor by the woman who knows her best, Mary McDonnell. In this episode Mary and Mina discuss the Season 5 mid-season premiere “Heart Failure”. Have a Major Crimes/Mary McDonnell fan in your life? Please share this podcast with them or and leave a review on iTunes.